What is GIFT and how does it work? The specialist will give you fertility drugs to stimulate your ovaries. So that they develop several mature eggs for fertilisation. After the eggs mature the doctor will be able to identify the eggs with the help of an ultrasound and remove them from the ovaries using a fine hollow needle. After a few minutes one or two of the eggs will be combined with your partners sperm. 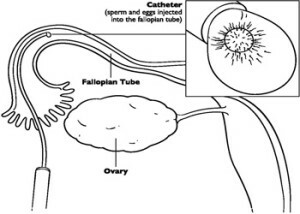 After a minor surgical procedure, the doctor will transfer the eggs and the sperm into the fallopian tubes , which would lead from the ovaries into the uterus. The doctor will do this using a fibre-thin tube either through a small incision in the abdomen or via a catheter, which is passed through the cervix. This procedure sets up for natural fertilization and implantation to take place. You would need to rest for a short period of time after the procedure and then you will be given progesterone to help the lining of the uterus to get ready for implantation. This can be given by an injection, pessary or gel. This procedure is the preparation & monitoring of the growth of eggs, which is identical to the procedure of In-Vitro fertilization (IVF). Instead of the eggs being fertilised, in the laboratory similar to “IN-Virto” the healthiest eggs and sperm are placed together in the women fallopian tubes, as off in a natural conception which takes place in the body naturally. A number of clinics even though licensed to offer this procedure, very few clinics practise it and it is on low demand. Patients who have failed the attempts of IVF. How long does GIFT treatment take? This treatment takes up to four to six weeks, with this procedure GIFT ( gamete intrafallopian transfer ) ,egg retrieval and gamete transfer happens in the same operation. This is a minor surgery, where after the surgery you can go home the same day.